There’s been considerable concern, for good reason, about Hillary Clinton’s Wall Street ties, but I don’t think this is the biggest problem to be concerned about should she be elected. I am even more worried about her neoconservative foreign policy views, and being a lackey for the military-industrial complex. Jeffrey Sachs, Director of the Earth Institute at Columbia University, described the problem, starting with discussion of John F. Kennedy. Perhaps Ted Kennedy even thought of the vast differences between Clinton and his brother when endorsing Obama over Clinton in 2008. In rare cases, great presidents learn to stand up to the CIA and the rest of the military-industrial-intelligence complex. JFK became one of the greatest presidents in American history when he came to realize the awful truth that his own military and CIA advisors had contributed to the onset of the Cuban Missile Crisis. The CIA-led Bay of Pigs fiasco and other CIA blunders had provoked a terrifying response from the Soviet Union. Recognizing that the U.S. approach had contributed to bringing the world to the brink, Kennedy bravely and successfully stood up to the warmongering pushed by so many of his advisors and pursued peace, both during and after the Cuban Missile Crisis. He thereby saved the world from nuclear annihilation and halted the unchecked proliferation of nuclear arms. 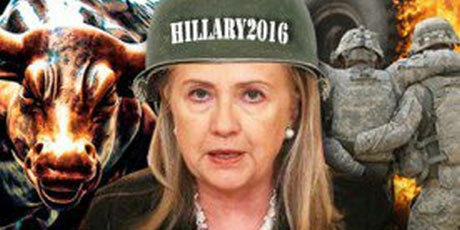 Clinton’s speech shows that she and her advisors are good loyalists of the military-industrial-intelligence complex. Her speech included an impressive number of tactical elements: who should do the bombing and who should be the foot soldiers. Yet all of this tactical precision is nothing more than business as usual. Would Clinton ever have the courage and vision to push back against the U.S. security establishment, as did JFK, and thereby restore global diplomacy and reverse the upward spiral of war and terror? Just as the CIA contributed to the downward slide to the Cuban Missile Crisis, and just as many of JFK’s security chiefs urged war rather than negotiation during that crisis, so too today’s Middle East terrorism, wars, and refugee crises have been stoked by misguided CIA-led interventions. Starting in 1979, the CIA began to build the modern Sunni jihadist movement, then known as the Mujahedeen, to fight the Soviet Union in Afghanistan. The CIA recruited young Sunni Muslim men to fight the Soviet infidel, and the CIA provided training, arms, and financing. Yet soon enough, this US-created jihadist army turned on the US, a classic and typical case of blowback. The anti-U.S. and anti-Western blowback started with the first Gulf War in 1990, when the U.S. stationed troops throughout the region. It continued with the Second Gulf War, when the U.S. toppled a Sunni regime in Iraq and replaced it with a puppet Shia regime. In the process, it dismantled Saddam’s Sunni-led army, which then regrouped as a core part of ISIS in Iraq. Next the U.S. teamed up with Saudi Arabia to harass, and then to try to topple Bashir al-Assad. His main crime from the perspective of the U.S. and Saudi Arabia: being too close to Iran. Once again, the U.S. and Saudi Arabia turned to Sunni jihadists with arms and financing, and part of that fighting force morphed into ISIS in Syria. The evidence is that the covert U.S. actions against Assad pre-date the overt U.S. calls for Assad’s overthrow in 2011 by at least a couple of years. In a similar vein, the U.S. teamed up with France and the UK to bomb Libya and kill Muammar Qaddafi. The result has been an ongoing Libyan civil war, and the unleashing of violent jihadists across the African Sahel, including Mali, which suffered the terrorist blow last week at the hands of such marauders. O’Malley and Sanders wisely and correctly support an America that works with other countries and with the UN Security Council to build peace in the Middle East rather than an America that continues to indulge in endless and failed CIA adventures of regime change and war. While Clinton arrogantly demands that other countries such as Russia and Iran fall squarely behind the U.S., O’Malley and Sanders recognize that it is through compromise in the UN Security Council that we can defeat ISIS and find lasting solutions in the Middle East. Whether Clinton could ever break free of the military-industrial complex remains to be seen. If she does become president, our very survival will depend on her capacity to learn. O’Malley and Sanders did criticize Clinton’s foreign policy views in the second Democratic debate, but it is clear that Bernie’s heart is in attaching her Wall Street ties. I wish he would pay as much attention to her ties to the military-industrial complex and her overly hawkish foreign policy views. It could be hard running against those who pander to fear, but it is important to do if we are to avoid perpetual warfare under either Clinton or a Republican president. As the most popular Senator in America, Sanders might be able to pull this off. Iowa has long been a strong state for anti-war movements, and the Democratic primary voters should respond to this issue. Posted in Bernie Sanders, Foreign Policy & National Security, Hillary Clinton, Martin O'Malley, Terrorism. Tags: Bernie Sanders, Hillary Clinton, ISIS, Martin O'Malley, Terrorism. RSS feed for comments on this post.. TrackBack URL. CLINTON AND CLINTON COMBINE WAR STRATEGY. MISS YOU AIM. WAR MONGERS. Thanks, please fix the link to Huffington Post piece about why Hillary's plan won't work. It's returning a 404 error.